to leave China on Hillary Clinton’s plane. So what happened? Did the Americans sell him out? The Obama folks may be cynical, but they’re smart enough to have known that if Chen walked into a bait-and-switch, that would be a big problem not just for him but for them. It doesn’t make sense, even in Machiavellian terms, that they’d have wanted to seriously mislead him. That sounds right to me. Even if you look at this in the most cynical political way, Obama would have known perfectly well that he couldn’t sell out Chen without the entire world knowing about it immediately. And that, of course, would open him up to exactly the kind of opportunistic jeering that Mitt Romney so drearily delivered on cue today (“This is a dark day for freedom and it’s a day of shame for the Obama administration”). 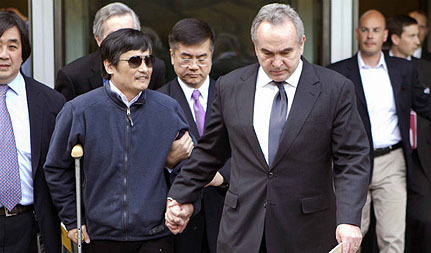 At some point one or more internal police officials either got to his wife or got to Chen after he’d left the embassy and told him in the most bloodcurdling and alarming way that he was under threat, that they would be watching and waiting, and that his wife and family would meet very unpleasant fates once the security forces got him back out of Beijing. And they would have told him in a very chilling way that he was not to tell anyone about this little conversation….After that kind of talk, a weary and blind man, much more worried about the safety of his family than about anything that would happen to him, might well change his mind about staying in China — and might also need to give a good reason for the change of mind without mentioning any recent encounters with the security forces. This is a completely speculative theory with no evidence, and other explanations are possible. But it fits the known facts. Maybe. In any case, it’s the most plausible story I’ve heard so far. Stay tuned.